Character Counts! week for 2018 was one to be remembered! Our Jaguars recognized each day of the week with a different dress-up theme to match a Character Counts! pillar. We teamed up for trustworthiness, cozied up to show we care, exercized our resonsibility, were heros for respect and donned our Fox Chase spiritwear for fairness. The week was a fun success. New this year was a penny war. 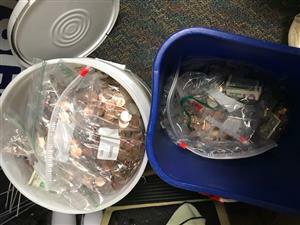 Students brought in coins - pennies added to their grade level totals and any other coins were dropped in other grades' bins to subtract from their totals. The competition was contagious as the grades battled it out all week. Each day found a new grade at the top of the collections. The ultimate winner when the dust all settled and the last coin was counted was first grade! However, due to the overwhelming generosity of our Jaguar families, the true winners were Hesed House as we were able to generage a donation for them of $1107.76! Thank you to all of our families who sent in coins, students who opened up their piggy banks and student volunteers who gave up recess time to help count these huge buckets of coins last week. Your caring hearts will make a differnce in many lives!